Who I am, What I do and What I promise! Ron Prentice, the truth, the whole truth, nothing but the truth! My first encounter with the McNab Shepherd occurred in Northern California, on Ridgewood ranch in the early 70’s. Freshly married with a new family moving from a ranch in Wyoming where I was cow boss. The move to Mendocino county was an eye opener, as the cattle I had been around in Wyoming were easy to handle and dogs were usually not a requirement. Upon arriving in California, I realized that the cattle and country would take a bit of getting used to. The people on the ranch were far from horsemen or cattle people and on this big expanse of Manzanita and Chemise brush covered hills, the cattle were wild and hard to gather. When I first arrived, the ranch hired someone to help me gather the cattle. We would sort off the older cattle and sell what we could. We tried for days and were only able to gather 15 or twenty out of about 100 head. We hauled the cattle to livestock auction in Ukiah, which was just down the road from the ranch.. I was fortunate enough to meet the owner of the livestock auction Rudy Mora and his partner Melvin Rodriquez. In our initial conversation. I was telling Rudy and Melvin how hard the cattle were to gather, and Rudy told me he leased the place next to our ranch and that he would come with his son and dogs the following Monday and help us gather he rest of our cattle. That next week started my love affair if you will with the McNab Shepherd. I had never ever seen dogs that could maneuver around in rough country and stop and hold wild cattle or that were so athletic. I was sold on how smart and easy to handle the dogs were and how they appeared to read Rudy’s mind before he gave a command. The dogs were fearless. Rudy told me the history and about the McNab ranch and that is all it took. My first dog came from the McNab ranch then followed with a female from the Hunt ranch at Laytonville. 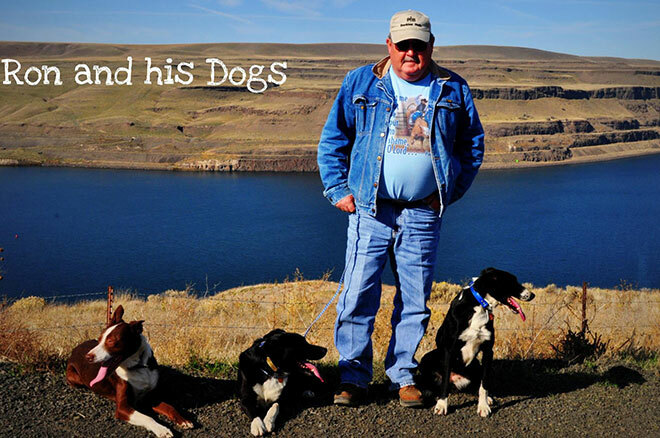 I have had a relationship with the McNab for 47 years and I made a promise to an old rancher that I got my first dog from that I would never ever crossbreed these awesome dogs. I have worked on ranches in Wyoming, Washington State, Oklahoma, and New Mexico and no matter where I go these dogs do their job no matter what it is. They are always willing to please and to accomplish the mission at hand. My dogs and I have a relationship, they understand me and are always ready to go do their job. When I raise a litter, I only breed the best to the best. My whole mission in my life time has been to raise the most awesome dog breed on the planet. Each dog’s resume speaks for itself.